NOTE: This is an excerpt of a module from the Sharenet Crypto Bootcamp seminars that have been running in Cape Town and Johannesburg. 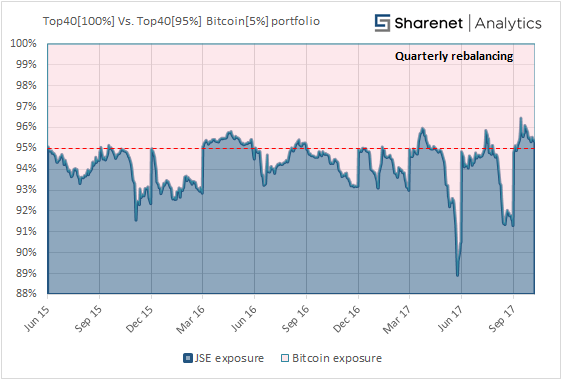 Quite often we have referred to 1% to 5% exposure to Bitcoin (or Crypto) as being prudent for traditional equity investors. The value varies depending on what article you read, but this is typically the maximum exposure to any one mid-cap or large-cap share in a reasonably diversified share portfolio. The argument is that the potential upside for Crypto (in an ideal world where everything goes right) far outweighs the maximum 1-5% downside to your investable assets (assuming your whole crypto investment goes to pot). 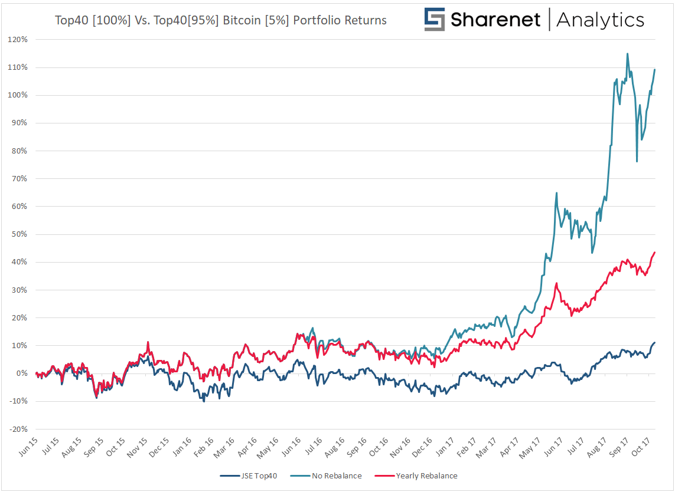 Now of course there is the argument that Crypto is speculative and not an investable asset but there are strong arguments both for and against this, so we will not debate this point here. Instead let’s show how a small bit of Bitcoin could have boosted your investment portfolio. And there is the asymmetry in its full glory. 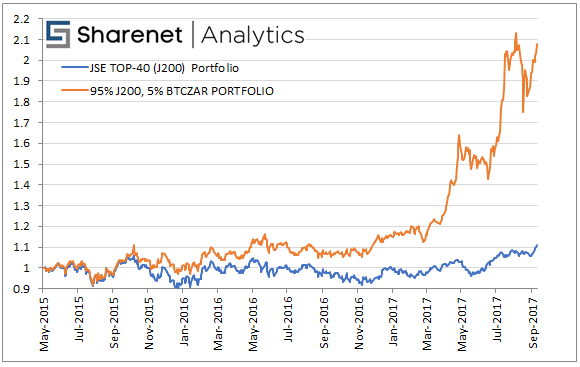 A conservative 5% initial speculative crypto component to your portfolio delivered outsized overall returns. And if Bitcoin had completely blown up, at most your equity would be 5% poorer. This is a massive risk/reward ratio. The rewards are outsized compared to the potential maximum risk. What’s not to like about this? 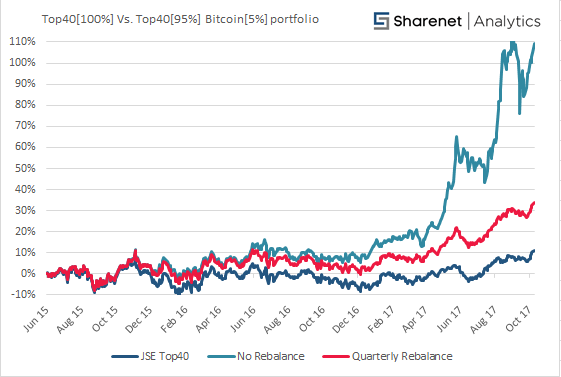 With annual rebalancing, to ensure Bitcoin doesn’t dominate more than 5% of your exposure, would have yielded a 45% return against the JSE’s 11% return. This is still a huge difference. You increased your returns 4-fold by risking 5% of your equity. Asymmetrical poetry. What about quarterly rebalances? An example is below where we can see returns drop slightly from 45% to 35% over the same period. Now this strategy presumes Bitcoin will continue its rise. 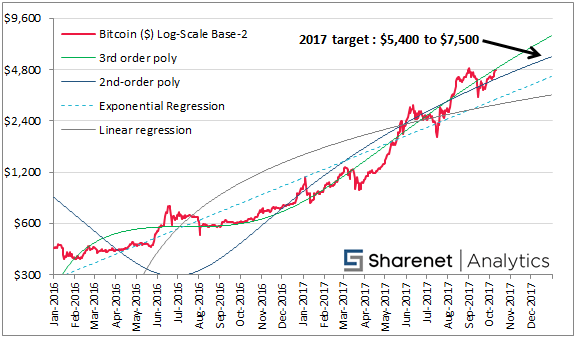 For the last year our regression forecasting model has held fast, and if it continues to hold fast we should finish up 2017 with $7,000 a Bitcoin, or North of R90,000 per coin. To summarize, a little bit of Crypto exposure, 1-5%, coupled with quarterly or annual rebalancing can go a long way to supercharging your investment returns. 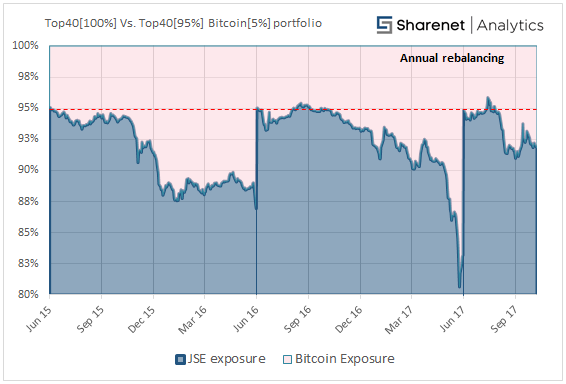 On the assumption that the Crypto assets are appreciating much faster than the JSE assets, then your JSE account will be subject to continual purchases whilst your Crypto exchange account will be subject to continual disposals to realize profits and fund the JSE purchases. This isolates any tax events to your Crypto exchange account. 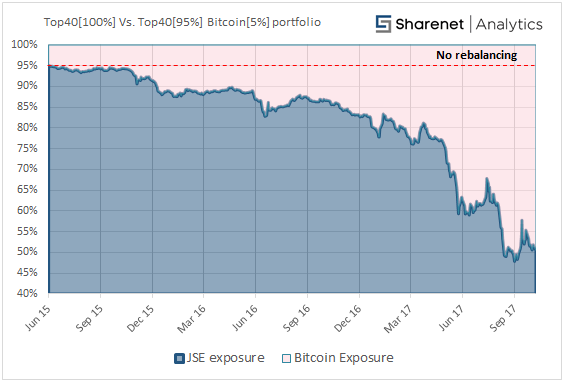 And on that point, please note that tax deductions for profits realized on the Crypto assets disposals and dividends on your JSE portion were not taken into account on the above exercises.